Ahmedabad is a wonderful city that has gone through massive development over the past couple of years and the city’s infrastructure is nothing short of spectacular! Without a doubt, Ahmedabad elegantly checkmarks every element required for a modern-day lifestyle. May it be residential or commercial property, the real estate sector in Ahmedabad is booming today. Ahmedabad is one of the top metropolitan cities in the country and has a lot to offer its residents. Property demand in Ahmedabad has up-scaled today and a number of location in the city and its outskirts are coming to light. Out of the different prime locations, S.P Ring Load is an area that many seem to be talking about. Situated in Western Ahmedabad, S.P Ring Road is a locality that has gained major popularity after the development of the ring road and its close proximity to Bopal, Thaltej and the Sarkhej Gandhinagar Highway. S.P Ring Road is an area that is going through major development as it offers branded materials at a super-low cost along with a well-balanced lifestyle that buyers are actually looking out for. S.P Ring Road is where you will find beautiful infrastructure surrounded by the beauty of Mother Nature. While this location offers fast and easy commuting to a number of places, its social infrastructure is simply fab! Residing at S.P Ring Road gives you convenient access to several landmarks that include reputed schools, colleges, hospitals, medical centres, malls, supermarkets, shopping centres, retail outlets, banks, ATMs, cafes, cinemas, restaurants, convenience stores, transportation facilities and more. You can head out with your family, meet your friends and have a great social life without worrying about long-distance journeys. Needless to say, residing at S.P Ring Road will keep you happy and entertained each and every day. Several real estate companies have diverted their attention to S.P Ring Road today, keeping the property demand at this area in mind. As the property prices at this location are rising at a steady rate, S.P Ring Road is a gold mine for investors as well as individuals looking out for new homes in Ahmedabad. While the option of residential projects are many, choosing the right project is very important in order to gain better returns and higher property value in the days to come. You should definitely consider the latest development by Shivalik Ventures, especially if you are looking for luxury that is surrounded by lush greens. 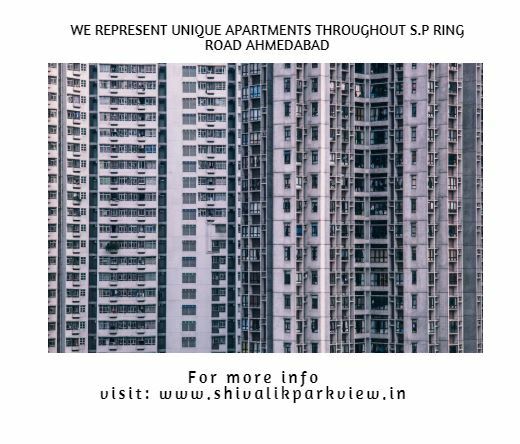 Spread over vast acres of land, Shivalik Sharda Park View is an elite residential project at S.P Ring Road, Ahmedabad by Shivalik Ventures that contains 6 magnificent towers and offers 3BHK luxury apartments with areas starting at 1440 sq. ft. This residential undertaking is packed with luxury and comfort that will be loved by one and all! The apartments are spacious and contain high-end fittings, large doors and windows, beautiful kitchens, safety features and more. This development also offers a plethora of external amenities that include a yoga room, library, skating rink and box cricket area, medical centre, theatre, Wi-Fi connectivity, multipurpose hall, swimming pool and strong security. Starting at a price of Rs.47.16 lakhs, the apartments at this development are high on luxury, but low on cost. Home-lovers aspiring to own a home in Ahmedabad can buy an apartment in Shivalik Avenue. The residential complex has been developed in Bodakdev one of the most popular localities in Ahmedabad. The estate comes with 4 BHK apartments, loaded with amenities that will refine your lifestyle. The developers have carefully chosen the location of the residential complex, enabling the residents to get across to the important places around the city in quick time. Mumbai is known for its commercial importance, and the social infrastructure in the city is well-developed. Get a classy home in the residential complex and enjoy the large plethora of lifestyle and healthcare amenities in the complex. Homeowners and real estate investors looking for a quality apartment in Ahmedabad can go for Shivalik Legacy. This residential complex has been developed in Satellite, one of the busiest localities of the city. You can buy elegantly designed apartments with a wide range of amenities in the complex. The residents can buy 4 BHK apartments in the estate, and enjoy the classy infrastructure in the residential complex. The location of the complex has been carefully chosen, ensuring that the residents can easily get across to the places of business and entertainment from their homes. A large number of colleges, schools and healthcare centres are located close to the complex. Get a home here and experience the sophisticated lifestyle.